New Titles Uploaded — 27,000 New Pages! Hoosier State Chronicles has just uploaded several brand new titles into our online search engine. Historians, genealogists and other curious researchers can now dig into some historic newspapers from Bloomington, Indianapolis, Bedford, Hammond, New Richmond, Sullivan, Smithville, and tiny Orland up in Steuben County. While our available run of Hammond’s Lake County Times currently includes just three years (1920-22), we’ll add issues of that great paper back to its start in 1906 in coming months. 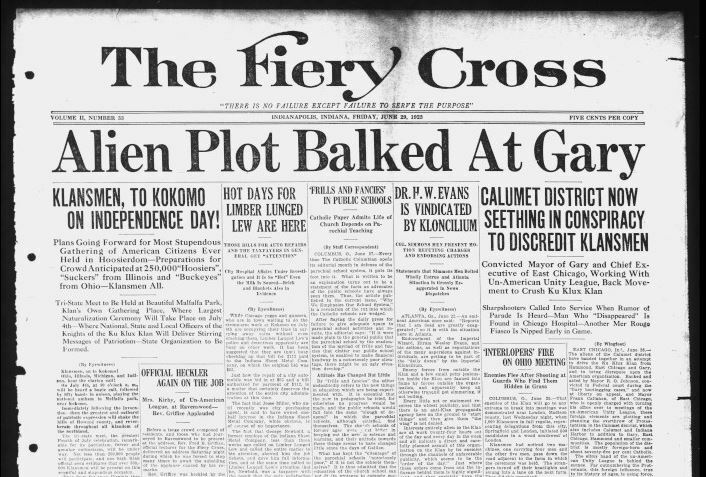 Our newest batch also includes a controversial choice for Hoosier State Chronicles, but one which is of enormous historical value: the Ku Klux Klan’s Fiery Cross. From the early to mid-1920s, the Klan edited and printed its influential Indiana State edition from the Century Building in downtown Indianapolis at a time when the Invisible Empire was largely headquartered in Indy. Although HSC and the Indiana State Library in no way endorse the views of the KKK, we trust you’ll find The Fiery Cross a fascinating read. The paper is an integral part of the history of radical right-wing politics, nativism, anti-Catholicism, anti-Semitism, white supremacy, the battle over religion in public schools, and American attitudes toward immigration. Cast a glance at American politics today and what seems like old 1920s news is still hugely relevant. We expect that some members of the public might be offended by our making The Fiery Cross available on the web, but we stand by its value as a historic document. If you’re looking for a strong anti-Klan perspective, many Hoosier editors took a stand against the group in the 1920s. We recommend several papers available in Hoosier State Chronicles: the African American Indianapolis Recorder, George R. Dale’s ferocious (and humorous) Muncie Post-Democrat, and the great Indianapolis News. The microfilm collections of the Indiana State Library also contain two other notable Indianapolis newspapers that opposed the KKK. These are the Pulitzer Prize-winning Indianapolis Times and the Indiana Catholic & Record, forerunner of the Catholic archdiocese’s current newsletter, The Criterion. Although the Indiana Klan’s heyday ended in the late 1920s, we would also like to point out that Hoosier State Chronicles makes available the Jewish Post & Opinion from the date of its inception in Indianapolis in 1933 all the way up to 2005 — a paper that has fought for many decades to raise awareness of racism in the U.S. and abroad. And another old, old issue of the Indiana Territory’s first newspaper the Indiana Gazette from April 10, 1805.